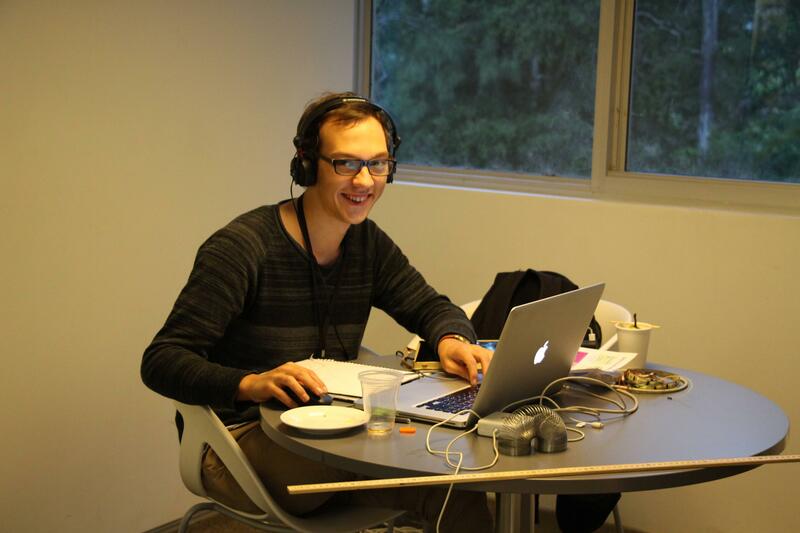 This past weekend I competed in Hackagong, a 36 hour weekend where participants work in small teams to create something awesome. 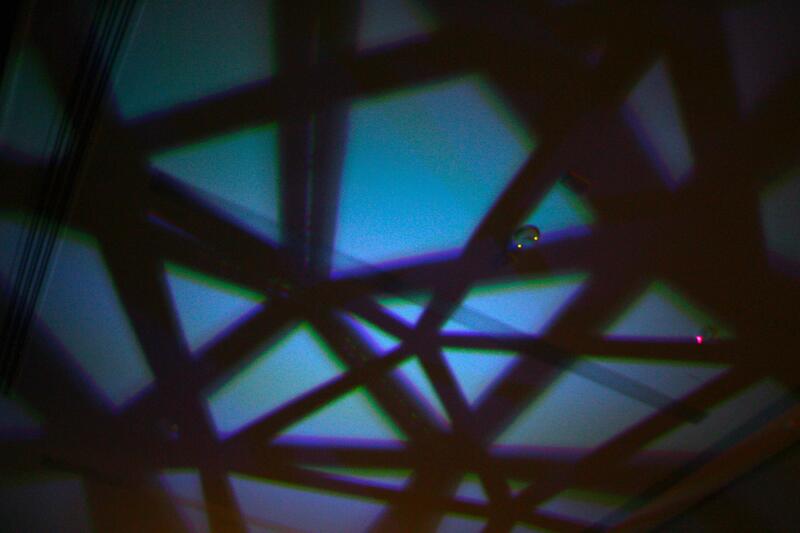 This year I created geolight, two nested 3D printed geodesic domes and lights that create beautiful shadow patterns all over the room where geolight sits. 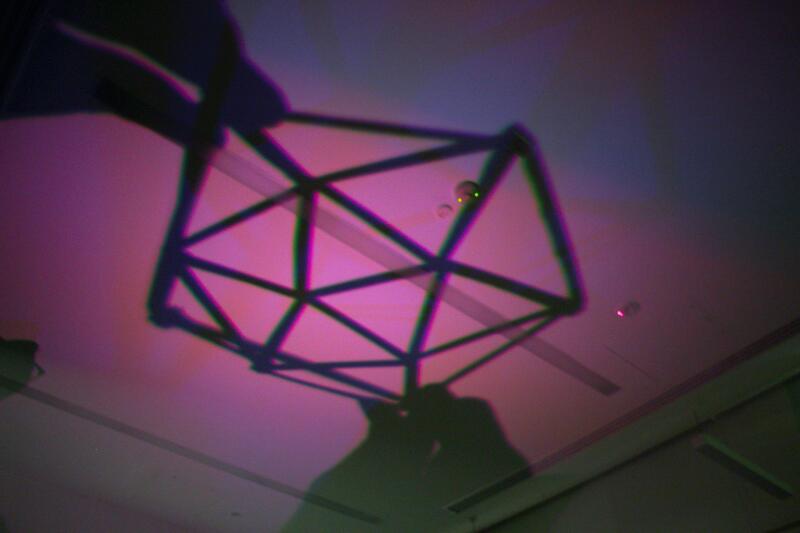 In less than 24 hours I moved this project from a thought to a computer model to a physical tangible object to a shapeshifting shadow machine. Most of it was possible through 3D printing. Having the ability to turn thoughts into reality so quickly is intensely satisfying and gratifying! 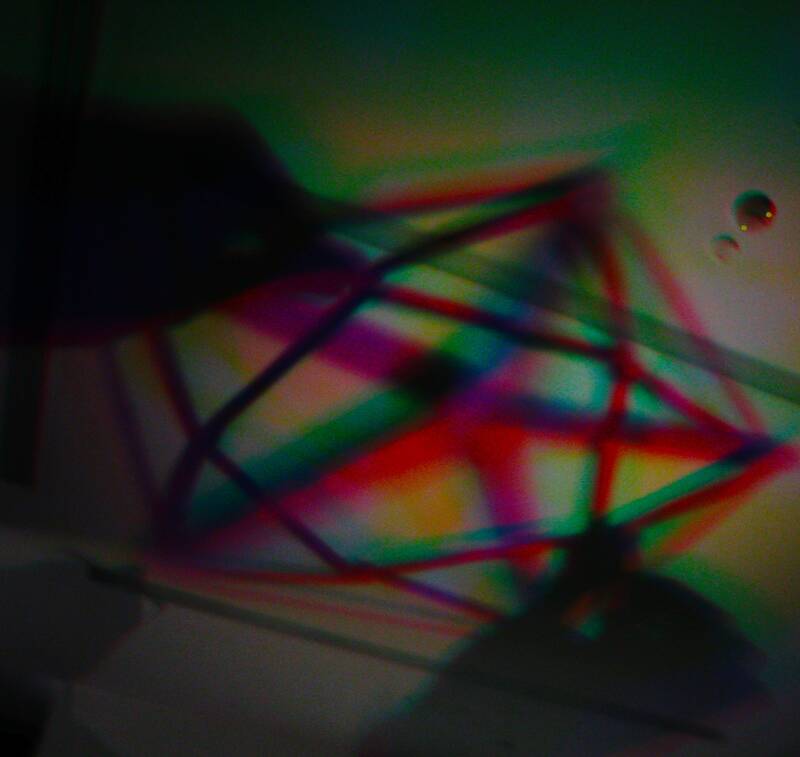 Before going into hackagong I knew I wanted to make an object that could be used to create shadows, and would probably involve the beautiful patterns created by a geodesic dome. 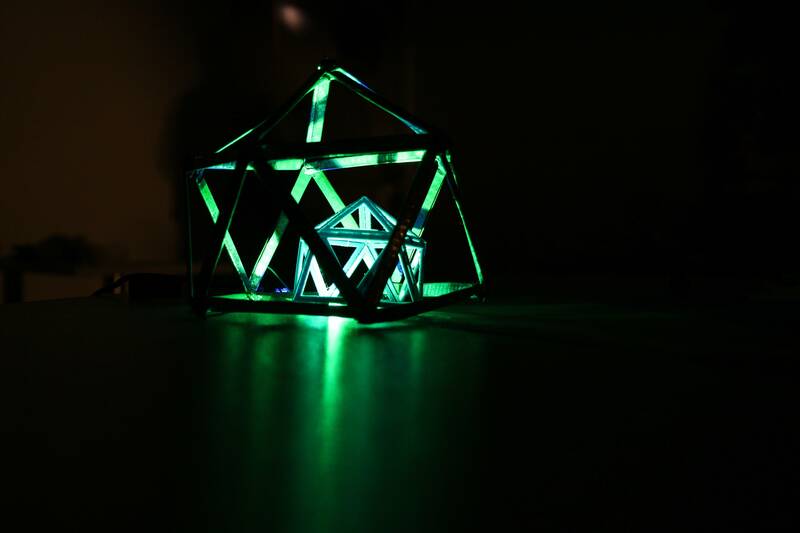 As of friday night my plan was to make a hand held full geodesic dome which would have a light inside that could be used to create cool shadows. As I was cycling towards hackagong (I was right near north gong station) the thought came to me that it would be much more interesting seeing the shadows of two objects interacting. I have previously played with lights and shadows, and one of my favourite things it the huge change in scale, and also our brain's ability to determine depth from a 2D image. 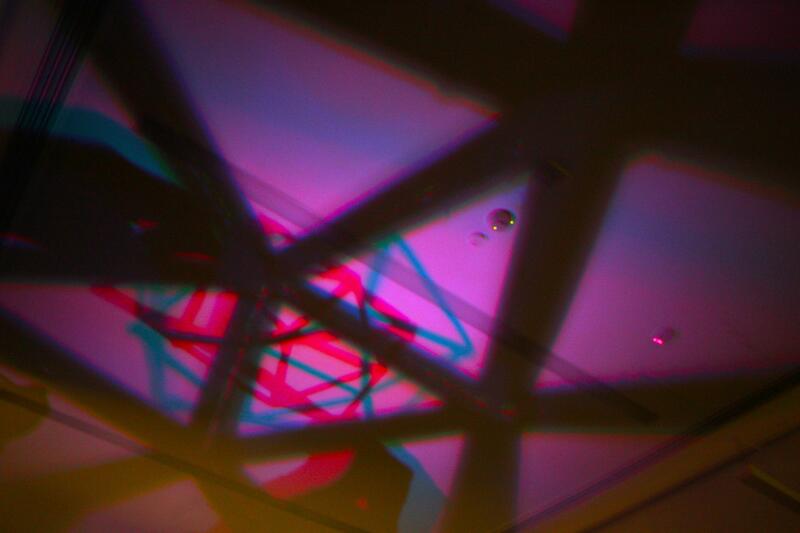 I wanted to put them together by projecting shadows onto the celling and walls of any room. I started to draw a quick sketch (on pen and paper) of what I wanted to 3D print. I talked to Chris (the build ambassador at Hackagong) about the dimensions I could print in and the feasibility of my project. He gave me the dimensions and thought my idea was cool and would work. I jumped back on the computer and started to build the geodesic domes as 3D models in sketchup. I found a great instrucable with instructions on how to build the model, as well as downloadable examples. I opened up the V1 example. I built the model into an enclosed object that could be sent to the printers. I downloaded an .stl exporter for sketchup and after fiddling around with the model, I took it over to Chris to have a final run through before we printed. He changed the scale and rotated it so it would be printed upside down as this would need less support materials and be faster. And then we printed it! 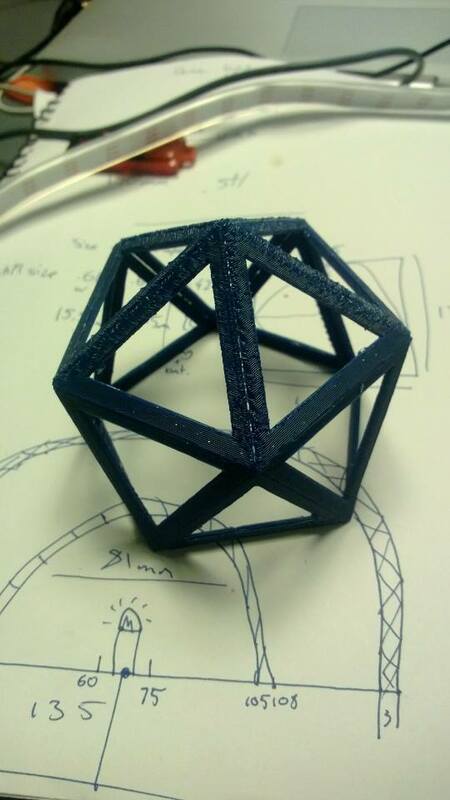 I chose to print my first 3D printed object with blue sparkly plastic. Have to make the first thing rememberable! Bucky would be so proud. In total it took about 4.5 hours to print. 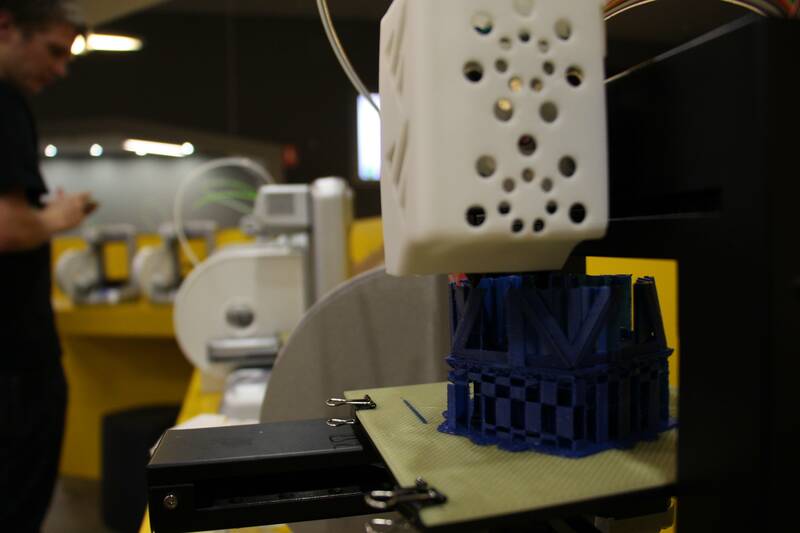 As you can see in the photos, the printer doesn't just print the object, but also a support structure that is used to hold it all in place while the object is printing. The next step for me to remove the support structure. With a little patience and a little pair of pliers, I managed to break free the dome from the supports. Pretty cool stuff! It was then time to work on the next, larger dome. My plan was to make a V1 dome for the smaller inner dome and a V2 for the larger outer dome. To move from a V1 to V2, all the triangles are split into 4, and then pushed out so all the points are equally spaced. The more triangles, the closer the object resembles a sphere. I finished the model and then sent it to Chris the wonderful printer ambassador. I had to wait my turn as other teams were using the printer. We loaded my model into the software and it said that it would take 9hrs to print. Chris ummed and ahhed, but I convinced him to let me print it overnight, starting at 11.30pm. The condition was set that if something messed up with the printing, I wouldn't be able to reprint. The ambient temperature of UniCentre in the middle of the night in the middle of winter was too cold for the 3D printers. The plastic didn't adhere to the base plate and started to peel off the plate. Less than 20 minutes into the print, it had to be abandoned. It was sad, but all the teams who were printing started talking to each other as we waited for our objects to be produced. A guy called Daniel from a team sitting near me thought my idea was really cool, and said that he had a geodesic dome at home that I could borrow for the weekend. Great news! His team mate had gone home to get some things, so would be bringing the model back at 2am. While I was waiting I did a bit of soldering and coding with my strip of LED lights. My plan was to use a BlinkM LED, but I couldn't find any in wollongong. I have ordered one from littlebird so I can further develop my idea. I used my trusty strip of 60 rgb leds, but I would like to use BlinkM because they can retain their programming of an internal circuit board and run of battery power. The strip lights are great for a concept, and soon enough lights were working and flashing and making cool shadows. Around 2:30 am, a beautiful 1V geodesic dome appeared on my desk. Made out of recycled tin cans, it was just the right size. Thanks Daniel! I went to find a dark space to try out the domes and shadows. Marc the IT guy came on the search with me. As we wandered around, we gathered a group of hackers jacked up on red bull... the first dark space we found was.... (no judgement) the guys bathroom downstairs. 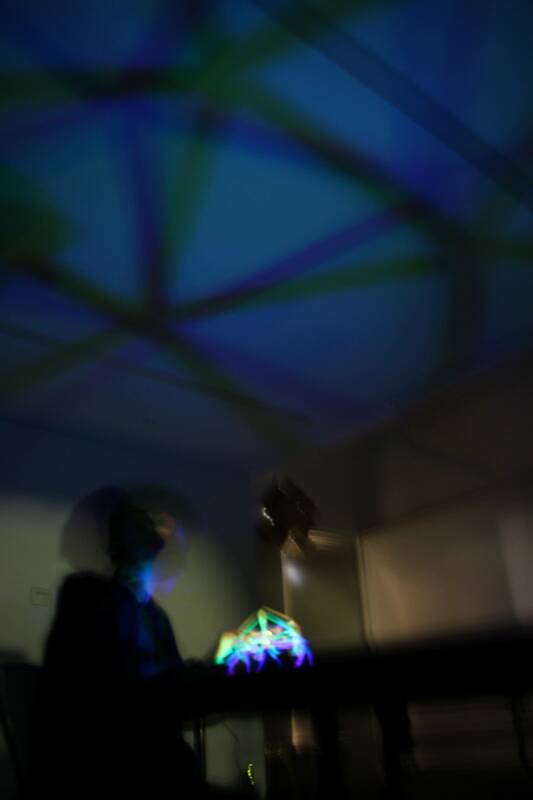 So, yes, we all hopped into a dark bathroom at about 3 in the morning and started to play with some coloured lights. It worked really well, but the situation was just a bit weird. We left and took over the HQ room, turned off all the lights, popped some bean bags on the ground, and turned on some Mission Control. Perfect. 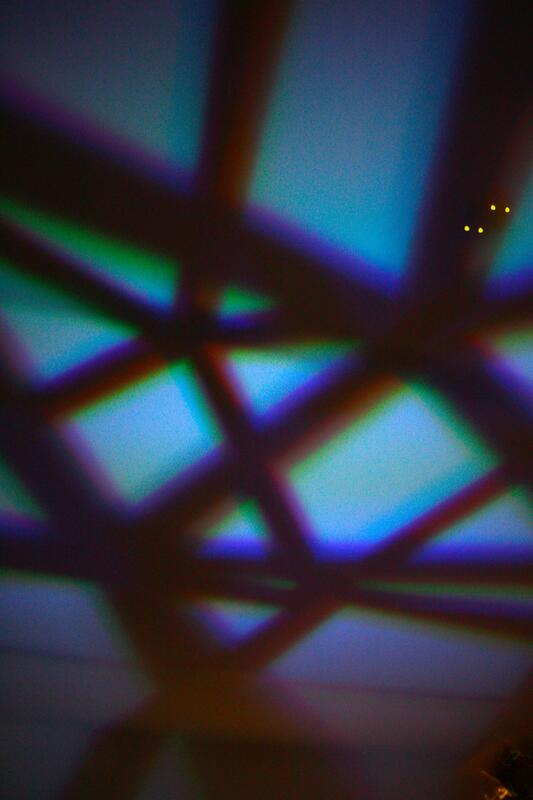 The lights came on and shadows were cast over the roof. I created some wonderful effects that simply do not translate to photos. The roof becomes a giant surface for shadows to loom over you. Beautiful patterns of dozens of triangles spread across your vision and suddenly it feels like you are in a completely different space. My favourite part of this, and what I want to keep on exploring is the sense of depth that our brains create from the movement of the shadows. If you close one eye and move your head, you can still gather depth information by the way things move. In a (2D) movie, your brain can still figure out depth even though that information isn't actually there. What I find really interesting is that the shadows created by geolight can give you enough visual information to determine the physical shape of the object casting the shadows, even if you can't see the object itself. The nested domes create irregular patterns and confuse the eyes. By using multiple lights and different colours, you can change the number of shadows, how they intersect and the colours of the shadows. After about two hours of experimenting with shadows, it was time for bed (5am!). I packed up my stuff and cycled home in the freezing wollongong air. I sleptwalked through a shift of work, and then returned to hackagong in the afternoon of the sunday to present what I had done to the judges and other teams. Lots of people were impressed, some of the judges thought it was a very interesting a unique use of 3D printing, and some people just didn't get what I was trying to do. I guess the problem of not understanding lies somewhere in the middle of us. I need to work on how to explain the weird concepts and oddities that I am working on, and I would like other people to be more open to weirder things. I do kind of like it though, that what I am trying to do is difficult to translate into words and pictures, and it becomes something that you need to see in real life. One of the judges asked for the business potential of geolight. I didn't really have an answer and I hadn't really thought of trying to sell it. I am putting the models online for you to print and the code too (see below). It is fairly simple and I would be keen to see what other people can do with the general structure of creating 3D shadows. Later in the evening when I put photos up on facebook a few friends asked if I was planning to sell it, and they would buy it, so yes! There is business potential. I think it needs a little more work before I would sell it, but it does seem like something that could sell: a 3D printed ambient light. 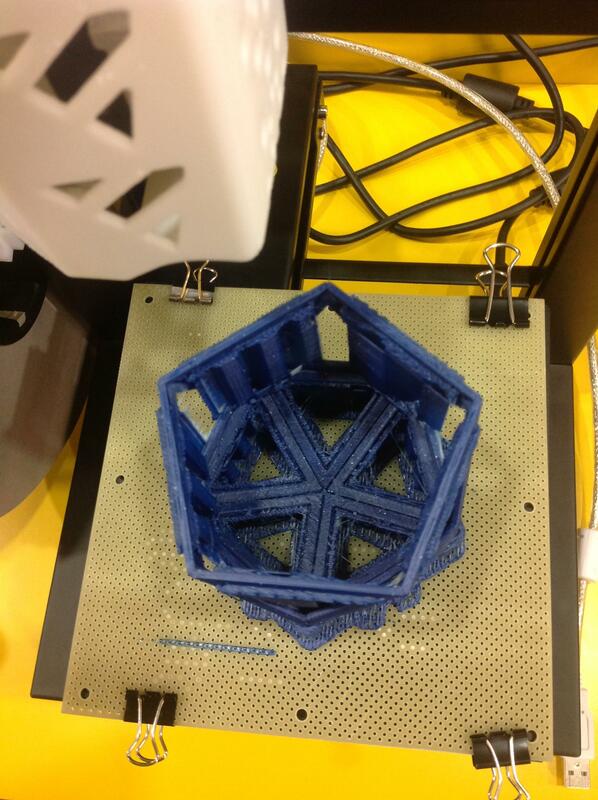 At least in this sweet stage where 3D printing is 'cool' and not quite mainstream. I could go along a arduino open source type route: you can buy the assembled model, or download the files and make your own. 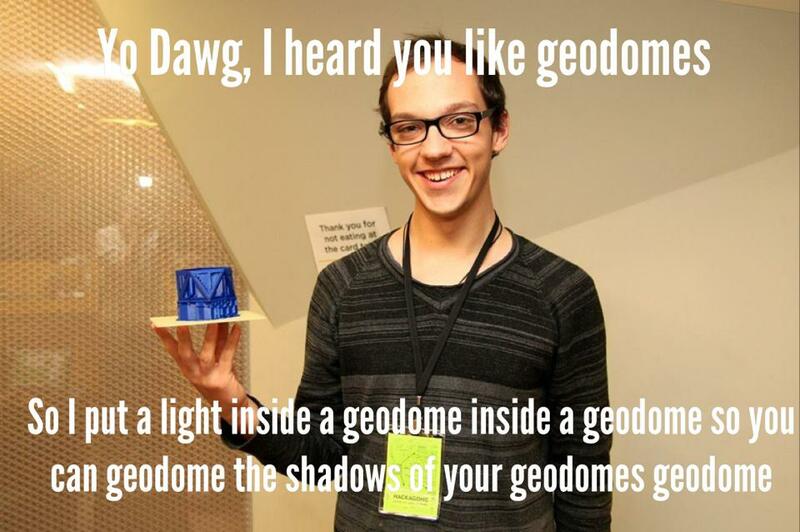 In the end, I didn't win any prizes for the geolight, but I had heaps of fun creating it. It gave me a taste of 3D printing and I want more! It is so easy to see how this technology is going to radically change the world. The experience of moving a thought to a physical tangible object was extremely gratifying, and being able to show what I was trying to do rather than explain what I am doing as I work towards making something was fantastic. 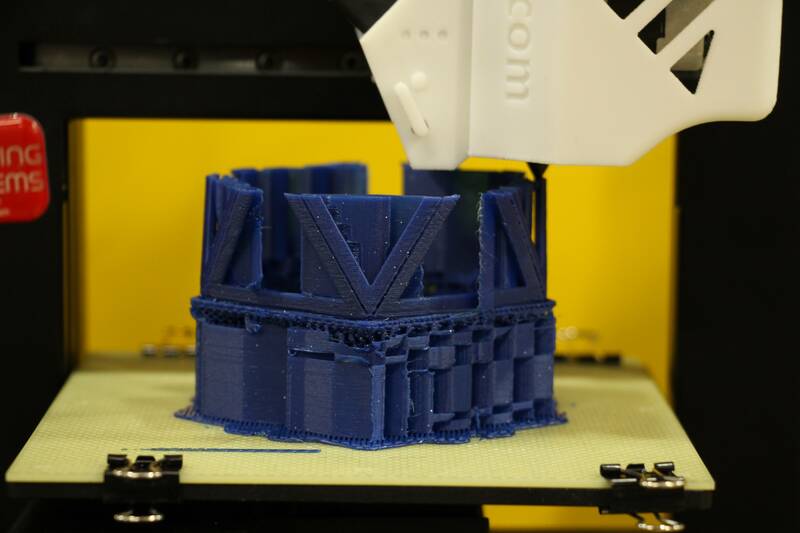 I really want to get my hands on a 3D printer, because once you start printing, hundreds of improvements come to you. This is what is so exciting about making things with a 3D printer, the turn around time is relatively short, and the cost of the materials is also relatively low (and is only going to get lower. Exciting times. You can find all the code that was used for the planetarium right here. Enjoy! SEGFAULT is the name of the game I have been working on for a couple of weeks and it was completed today. It uses gamestudio, which I ranted about yesterday, but I actually think it turned out ok. Im going to try and share the game with you, but for now, I have some screenshots to show you. Enjoy! Another late night at uni, another frustrating day with 3D game studio. Do not use this software. You would expect that you would be able to save the game as an .exe right? Something that everyone can play? Hahahaha no. This is game studio. Not even close. More pictures and stuff to come tomorrow. Yesterday's post was very text heavy. Here is a super interesting video to give you a break. Golan Levin's AMA Video Uses Experimental 3D Cinema from FITC on Vimeo. This is a really interesting interview, done all online. Questions were asked by the reddit community and then Levin responded in a video. They video was filmed with a Kinect sensor and a DSLR. 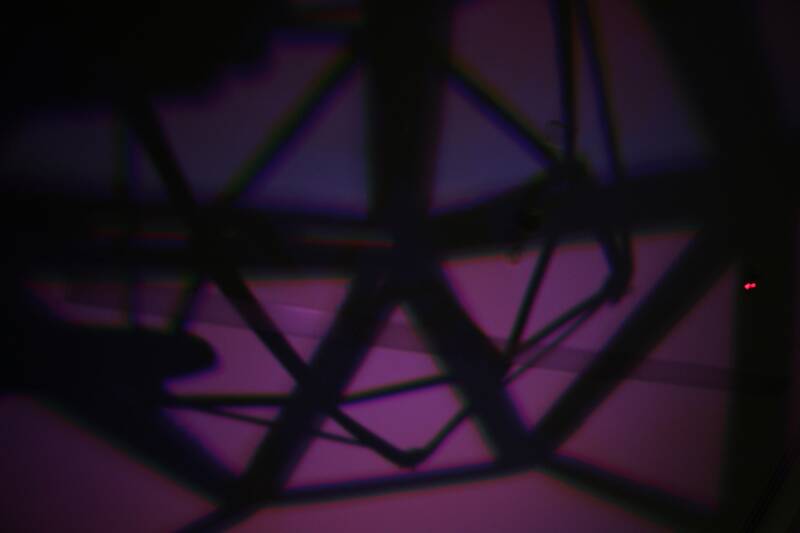 The DSLR provided the colour while the Kinect provided the 3D shape. Then the filmmakers used custom openFrameworks software that aligns and combines color video and depth data into a dynamic sculptural relief. From this they could then move a virtual camera around 3D space. Anyway, apart from the technical side of the video, a really interesting look at art + technology right now and the future. This is going to be a freaking nerdy post. Watch out! HEY, THIS STUFF IS IMPORTANT! Well, so says google. I think it is too. Google doesn't sell your actual identity to advertisers, they serve up an anonymous representation of who you are. Advertisers know I like media arts and computer science and know that I live in Wollongong, but they don't know I am Rory McKay, or my home address. I use Adblock, and so should you! So what are they doing differently now? Well, previously google's 'systems' were separate. Google ads showed results depending on what you searched for, youtube ads showed ads for things related to videos you were watching, and gmail showed ads based on the contents of your email. That just changed. Now google combines and collaborates all your information from across all the google network to super target ads to you (my words, not theirs). So now when I see ads in my gmail, they can relate to the youtube video I watched last night, or that place I looked up last week on google maps. I think that it is pretty interesting in regards to ads, and, you know, it will probably will make me more interested in the ads they display. Ads could become useful! Google could tell that I am looking at media arts websites, and it knows my location, wouldn't it be great if ads showed me when new galleries were opening with exhibitions that I might like? It could see that I am looking at Daft Punk videos on youtube and emailing my friends about wanting to go and see more live music, ads can appear for local shows by daft punk as well as similar bands. More targeted ads would mean less cost for distribution and a higher click rate meaning smaller and smaller people can get ads out and get their message out too. This TED talk highlights some of my concerns. Eli Pariser talks about how google can change the results you see depending on what you have searched before. For example, if I search for 'art gallery', the first result is the art gallery of nsw. Perfect! Well, yes, its where I live. If I lived in NYC and searched for the same thing, I would get results along the line of the met and moma. So what is the problem? Well it's actually pretty great that i get results that are more relevant to me. But is it? It is usefull for things like locations and maybe celebs that I am interested in, but what about politics? What about world news? If I keep on searching for Occupy Wall St. posts on youtube, my google results for 'politics' will start to skew left of field. If I use google news, that will skew as well. Then we get a problem of me being in a little leftist bubble with google filtering my news. Whoa, filtering news? Is this censorship? Hell no! It is google trying to be relevant to me! Google wants to give results that please me, results that make me want to keep on visiting google.com, results that make me want to click on google ads. I go on and on, reading about OWS, never seeing anything that challenges my views. I don't form any new opinions, well at least not any that are my own. My online life is now passing through a filter of things that google thinks I like. Some people may be ok with this, but I am not! I want my beliefs to be challenged! I want other people's beliefs to be challenged! Think of it this way: some guy is looking up family first on google. He never clicks on links about asylum seekers, never clicks on links about climate change. All he is interested in is footy and fred nile. If google sstarts changing the links and news he sees, he will never see the growing evidence of climate change, google knows he doesn't belive in it. He will never see images of asylum seekers being treated like cattle, google knows he doesn't care about them. How are we going to grow as people and a society if we are blocked off in our own little bubble? What can we do to stop this? Do we opt out of google? Do we rely on them not being evil? Did I need to come up with another rhetorical question? No. Anyway, thanks for reading this weird and nerdy rant. Leave a comment below and let me know what you think about the whole thing. I highly recommend you watch the TED talk that I linked above. Also, check out your Google Dashboard to see what services of google's you use and what digital trail you have left behind. Blogging! Here we go! The Polynomial is a game I guess. I like to describe it as an iTunes visualizer on meth. Stars form galaxies that change and morph in time to your music. You can fly around and shoot things that float around the universe. 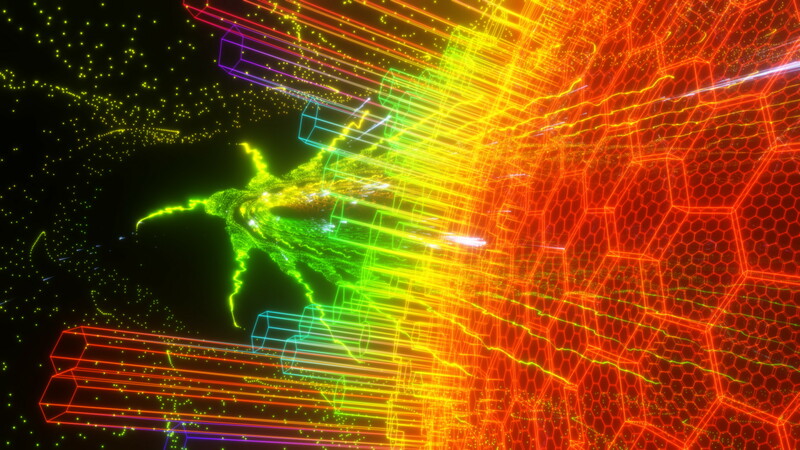 The Polynomial is a 3D musical 'space shooter' game, with non-shooter mode and built in fractal editor. Visuals are generated mathematically and animate to your music or microphone input; there are 4 music-driven animators and 38 arenas to choose from. You can create your own arenas using built in editor, and you can save your fractal images at any resolution. There are many parameters you can change for entirely new, original look; the number of combinations is astronomical. I'm not normally a fan of dubstep, but the polynomial thrives on it. There are lots of things that I enjoy about the polynomial. Here they are! Indie. Does it make me a hipster that I like it because it is indie? Possibly. I like the fact that one guy created this. One guy distributed this. We are at a really interesting point with game development, we have kind of cycled back to the roots, really small teams making what they want and distributing it how they want. With the internet and other online services (I'm looking at you, app store) it is now super easy to get out your product. That said, finding it is harder.... I'll talk about online stuff later.. The editor. Eff yeah. The editor makes me so happy. I love it when games give you the chance to create your own stuff! I think that is part of the huge appeal of games by Will Wright (The Sims, Sim City etc). I have heard stories of him coming up with the idea for Sim City after he was building cities for another game he was working on. Anyway, I'm getting distracted. The editor, amazing part of the game. Music! Why isn't this further up! I love love love that this game reacts to music! So good! More stuff should react to music! 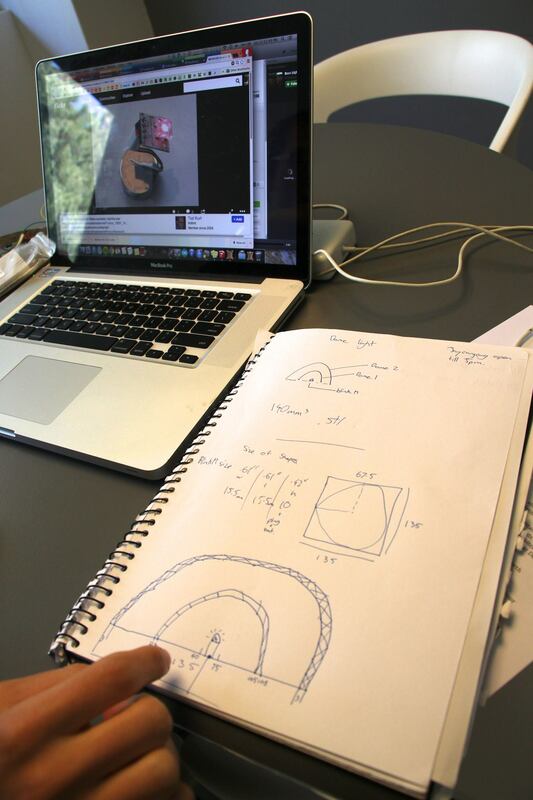 The polynomial can be downloaded for PC, Mac and Linux. There is a free demo and the full version has a 'pay what you want' model, with a minimum of $8USD (well worth it).